We offer self-catering lodging in 3 uniquely different areas. Camelthorn Chalet has a breath-taking vista of the Kalahari planes and golden sunset. Bessiebos campsite is unfenced. The luxury rooms, Hornbill and Pheasant in the green oasis of the main homestead boast a beautiful view. The working cattle and goat farm rests on the banks of the dry Kuruman River, amid massive camelthorn trees. The working cattle and goat farm rests on the banks of the dry Kuruman River, amid massive camelthorn trees. During your stay you will see many species of birds and game in the likes of the majestic Oryx, prancing springbok, Blesbok, Duiker, Steenbok, Warthog, Jackal and Lynx. Thota Lodge is ideal for those who want to get away from it all. Guests who need privacy and seek the secrets of this breath-taking land will find it at Thota. Set in tranquil, malaria free surroundings Thota is sure to exceed all your expectations. Escape into total solitude. Kick off your shoes and reflect on the more (or less) important things in life. For the past 30 years Thota proudly sustains the environment through responsible farming and dedicatedly maintaining the fragile ecosystem through proper management. Cattle, goats and sheep are raised on natural grazing on this 4000ha expanse of land. Antelope, large and small, share the land together with abundant insect and bird life. Conditions are harsh and it is often a case of the survival of the fittest. We are avid bee keepers and produce raw honey on this bee friendly farm. No chemicals, no additives! We are avid bee keepers and produce raw honey on this bee friendly farm. No chemicals, no additives! The health benefits are enormous! Honey is extracted twice a year from the hives, usually in April and September, depending on the rainfall. Kalahari honey has a very distinctive taste given by the flowers from the Acacia mellifera (Swart haak) during spring extraction. During the summer, bees feast on the flowers of groundcovers, Grewia flava (rosyntjiebos) and Acacia erioloba (Kameel) trees and the honey has a far subtler taste. We grow our own vegetables, not an easy task in the arid region, yet very satisfying when the nearest town is 70 km away! Enjoy fresh, sweet spring water which is a scarcity in the Kalahari Desert. Fresh water is obtained from boreholes sunken to a depth of 120m. In these harsh conditions water is a precious commodity and used with care. The protected camel thorn tree is a majestic subject to photograph during the golden hour at dawn and dusk. The protected camel thorn tree is a majestic subject to photograph during the golden hour at dawn and dusk. Camel thorns have a root system that can tunnel down to 100m into the ground to reach suitable water tables in the arid desert region of the Kalahari. They are an essential food source and provide shelter from the high temperatures to many birds and insects alike. 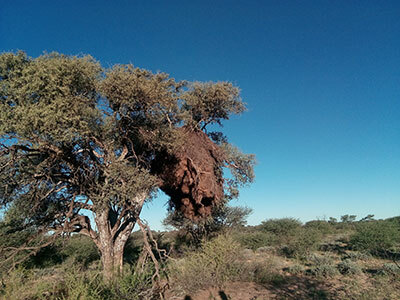 Most of the vegetation found in the Kalahari Desert have some medicinal value and were used extensively by the SAN people as natural remedies for ailments of all sorts. Pancreatium tenuifolium (aandblom) was used to create hallucinations by cutting the bulb open and applying the juice to the forehead. Momordica balsamina(laloentjie) when ingesting unripe fruit it caused nausea and diarrhoea and dried, crushed seeds were used to induce abortions, treat headaches, burns and sores. Citrullus lanatus (tsamma) an essential source of water for animals and humans and also used to make a tasteless but nourishing porridge.